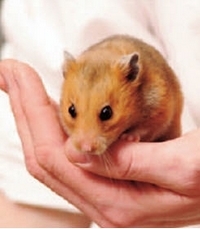 As we can see, hamsters embody the classic characteristics of their extended rodent family. For some reason, however, we have decided to designate them as pet rather than pest. As a result, we have seen the hamster family grow in type as well as numbers, often with the determined and very calculated assistance of humans. Today, hamsters who have forged long-term relationships with humans come in all sizes, colors, personalities, and geographical preferences. So before one simply lumps all hamsters under a single name and assumes that all are identical in behavior and lifestyle, it is wise to take a look into the world of these animals and see what differences exist between the various hamsters. The most well known of all the hamster species, the one most commonly kept as a household pet, is the golden, or Syrian, hamster. When parents regale their children with loving stories about their own childhood hamster, an animal with whom they bonded and learned to appreciate as a unique individual, that hamster was probably a golden. 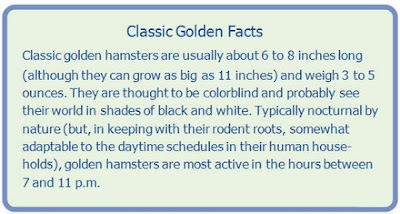 As his name suggests, the classic golden hamster is gold: typically, gold on his back with white on his underside (a pattern that is perhaps designed to camou- ﬂage the animal in his desert homeland), with large, dark eyes that help him navigate the terrain during his nocturnal forays. But in light of the popularity of this attractive pocket pet, humans have selectively bred the golden to alter what nature made. This has resulted in vast differences of appearances within the species. Technically, there is only one species of pet golden. But, thanks to careful breeding practices, there are now a number of varieties. Colors abound, including cinnamon, cream, white, black, silver, and more. Purists believe the original golden remains the most genetically healthy, because the colors are often produced by breeding related individuals. Coat patterns abound as well, evident in the spots and patches seen on so many contemporary hamsters. But of course, one would never ﬁnd such patterns on hamsters in the wild. Also absent in the wild are longhaired hamsters or those with short, soft, vel- vety coats. Yet pet hamsters with these characteristics do exist in captivity today, thanks to breeding practices that encourage the long hair of the so-called teddy bear hamster, and the shiny, velvety texture of the satin, both of which have become quite popular pets. There are also longhaired and shorthaired rex hamsters, whose coats are wavy and tend to stand out from the animals’ bodies. Rex hamsters also have curly whiskers. And ﬁnally, breeders have even produced hairless hamsters with nothing but curly whiskers.